Take a minute to think back to some of your past science fair projects or lab experiments. What elements did they have in common? What elements were different? While every project or experiment may have been unique in the problem they were trying to solve, they all followed the same basic template of title, problem, hypothesis, materials, procedure, data and results, and conclusion. This ability to notice similarities, differences and trends is called pattern recognition. The ability to then extract out the unnecessary details and generalize those that are necessary is called pattern generalization, which leads us to an abstraction. These are just some of the problem-solving skills that we apply when we design and run an experiment. Other skills include decomposition (the ability to break down a tasks into sub-tasks, e.g., when we specify each of the materials that we’ll need to conduct the experiment) and algorithm design (the ability to build a repeatable, step-by-step process to solve a particular problem, e.g., when we create the procedure so that others can understand our process and run that same experiment). All of these skills make up what we consider to be computational thinking (CT), a set of techniques that software engineers at Google and elsewhere apply all the time to write the programs that underlay the computer applications you use every day, including search, Gmail and Google Maps. Not only is this 21st century skill critical to being successful in the field of computer science, it’s also increasingly important to several careers outside of our industry given the ubiquity of technology in our lives today. As a result, many universities have expanded their traditional majors to now also include studies where key components involve computing. For example, computational neuroscience is the study of how the brain learns and computes, using computational principals to understand perception, cognition, memory and motor behaviors; while computational linguistics involves developing algorithms to process natural languages. With this changing educational landscape in mind, a group of California-credentialed teachers along with our own Google engineers have developed a program called Exploring Computational Thinking, which is committed to promoting CT throughout the K-12 curriculum to support student learning and expose everyone to this critical set of skills. Similar to some of our other initiatives in education, including CS4HS and Google Code University, we’re providing educators with access to our curriculum models, resources and communities to help them learn more about CT and discuss it as a strategy for teaching and understanding core curriculum, as well as easily incorporate CT into their own curriculum, whether it be in math, science, language, history or beyond. For more examples on computational thinking or for resources on how to expand on your own CT skills, visit us at: www.google.com/edu/ect. I’ve got good news for International job seekers interested in Microsoft software development opportunities, but not ready to relocate Stateside: we have jobs in the places you live. This is the first in a series to showcase some of our global development centers and development teams. They are working on a wide variety of different technology and products with the team sizes range from big to small. The one thing that they all have in common is that they have huge impact on products that are used around the world. So keep an eye on JobsBlog for my posts over the next months as we go around the world – meeting the people who build the software we use. For a listing of all of our development opportunities – visit the below links. There may not be openings right now in all of these locations, but join the Talent Network and get notified as opportunities become available within your location and technology interests. Thanks all – hope this helps you find that job you’ve been looking for….it is possibly closer to home then you thought! These days, everybody’s talking about how important it is to use social networking to find a job. That sounds good and all, but I don’t know where to start. Any suggestions? This phenomenon is not as random as it may seem. There is, in fact, quite a bit of science underpinning these "coincidental" events and experiences. This short path-length connection between people is seen in pop culture as the Six Degrees of Kevin Bacon and in business social networking as LinkedIn. Business social networking is simply uncovering and utlilizing these connections to find employment. Microsoft employees are the most active in social media and some 90% of our employees use LinkedIn’s 75-million-member site. If you are a looking for a job at Microsoft, connecting with our employees on LinkedIn is a smart first step. However, simply opening a LinkedIn account is not enough. You must learn to utilize LinkedIn for "finding" information and for "being found." Today, I’m going to discuss “finding” – the investigative aspects of the LinkedIn platform that help you to gain information and connections that will put you closer to a job at Microsoft. When one is seeking a job, researching the target company is a cornerstone of an effective job search. With LinkedIn, we can identify key hiring managers and recruiters and company groups with whom to connect. The first place I begin my research on LinkedIn is the company profile. You can find this company profile right from your personal LinkedIn page. For illustration, in the graphic below, I have entered “Microsoft” in the “companies” search box and pressed enter. We land on a page with three tabs: Tab 1 is an “overview” of the Microsoft company information. It functions as an aggregation of information provided about Microsoft and our employees and, for a job seeker, provides valuable intelligence on our company In this tab, there is a section for current Microsoft employees in your network and it allows you to “follow” Microsoft. There is also a unique section (highlighted with the red box) that gives the “before Microsoft” employment and “where Microsoft employees go” (if they’ve moved on from the company). As we work our way down the page, we notice a section for “new hires,” “alumni” or “former employees” and then a section for some informative statistics on Microsoft. Highlighted in the red box are stats that show job titles, gender statistics and tenure of employees who are on LinkedIn. LinkedIn also provides an update on “recent promotions or changes to the Microsoft employees’ profile.” Also featured are the most “popular profiles” as well as “recent changes” to Microsoft employee profiles. The final two sections highlight Microsoft “jobs” that are fed to the LinkedIn Network and a Microsoft “news” feed. Tab 2 reveals the identities of the 100,000+ people that are “following” Microsoft on LinkedIn. A “follower” will receive a LinkedIn message daily or weekly that updates recent hires and promotions at Microsoft; new job opportunities and updates to the company profile. It is a more detailed view of information that is provided on Tab 1. Tab 3 is an aggregation of all the Microsoft feeds. The company updates section (highlighted with the red box) is invaluable in a job search. The “go to job posts” link should be very useful as all of the open positions (that are open to external candidates) are posted on LinkedIn. At this writing, there are nearly four thousand open jobs at Microsoft and all are searchable in this tab. In conclusion, the first aspect of “finding” is to research the company on LinkedIn. As you can see, information for larger companies like Microsoft is plentiful. The second aspect of “finding” is to target hiring managers and recruiters and connect with them on LinkedIn. Stay tuned for my next post that addresses strategies to contact and engage hiring managers and recruiters. When we’re not out scanning and subsequently trying to read all the world’s books, some of us on the Google Books team actually like to watch television. So it is with some remorse that we watched Sunday’s season finale of Mad Men, AMC’s hit drama about a 1960s advertising agency–which, if you live in the US and you haven’t already heard of it or had someone in your life gush about it, you really should get out more. Besides providing ample display of period costumes and vices (smoking, boozing, adultery) the show is satisfying for its novel examination of the world of advertising. In depicting the creative process of the fictional advertising agency Sterling Cooper Draper Price, Mad Men argues that the catchphrases and images used to sell us beer and cereal reveal deeper truths about who we are as a culture. For some Ad Analysis 101, we harnessed the power of Google Magazine Search to look at some actual ads from 1964, the initial setting for the current season of Mad Men. These cultural artifacts hint at an American society on the brink of historical social change. By focusing in on the taste of cigarettes, perhaps the architects of the 1964 ad were speaking to a population already hooked on cigarettes. Whereas the earlier ad uses romantic imagery to attract new smokers, the later ad highlights the physical and gustatory sensation to an audience that is already craves them–even if scientists are starting to say they shouldn’t. In a Mad Men episode that some critics called the best of series, Don Draper and his ambitious protégé Peggy Olsen bicker over how best to compose a campaign for the the suitcase maker Samsonite. At one point Peggy presents an idea involving the celebrity endorsement of Joe Namath and cites the quarterback’s good looks as an obvious selling point for women. Don rebuffs Peggy, saying, “Women don’t buy suitcases.” As the above two-page ad from LIFE clearly shows, the real ad men behind Samsonite’s 1964 campaigns weren’t so sure about that. “an elegant summer traveler” for her. This split page ad suggests that advertisers were wary of alienating their male audience by focusing their energies on woman. 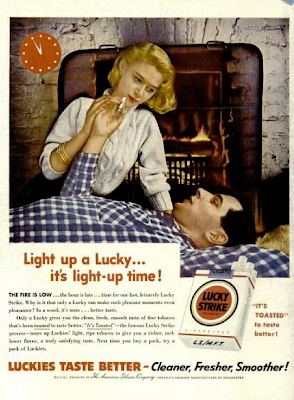 But they were also growing increasingly aware of the power of marketing to female consumers. 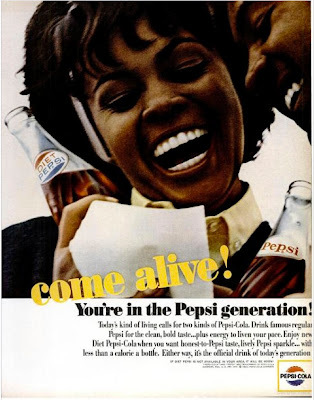 While the guys and gals of Sterling Cooper Draper Pryce didn’t pen any copy for Pepsi-Cola, this campaign from the soda giant justly belongs in this blog post in that it is part to the larger canon of 1960s iconic advertising. 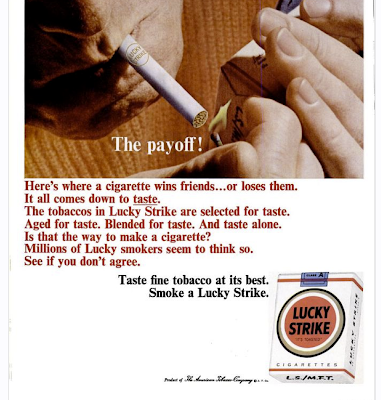 It was named by Advertising Age as one of the top ad campaigns of the century (#21 on the list of 100). 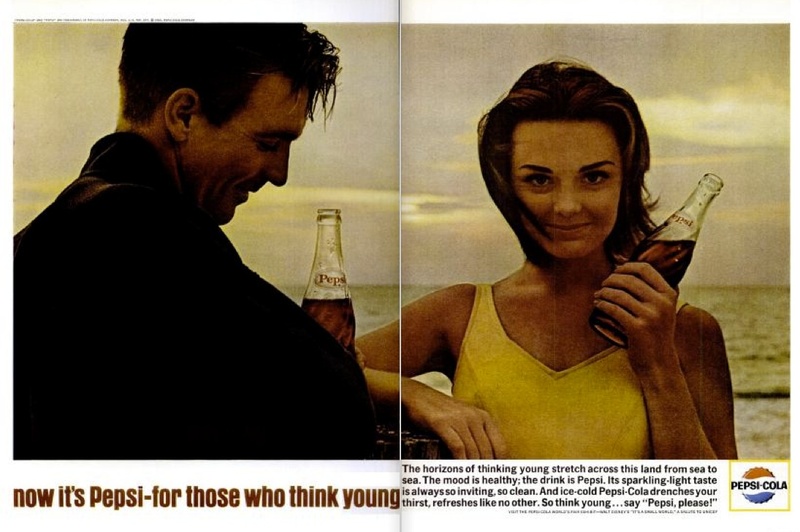 This particular spot from a July 1964 issue of LIFE illustrates where advertisers were increasingly aiming their attentions: the young. The copy reads: “The horizons of thinking young stretch across the land from sea to sea. The mood is healthy; the drink is Pepsi.” The reference to the horizon and the literal one stretching out behind this contented, attractive California couple, echo the “New Frontier” of Kennedy’s 1960 Inauguration. The ad capitalizes on the lingering hopefulness of a country about to be mired in a protracted war and a divisive national discussion that pitted old against young. Pepsi’s 1964 advertising also reveals the extent to which advertisers were awakening to the growing market of African Americans. This ad from an October 1964 Ebony provides an African American corollary to the otherwise white campaign found in most other magazines. LBJ signed the Civil Rights Act into law only a few months before the publication of this particular ad, and the inclusive tone of “Come Alive! You’re in the Pepsi Generation” links drinking Pepsi with integration. In this ad, they’re not just selling soda, they’re also selling promises of equality. We’ll have to wait awhile for a return to the 1960s via the exploits of Don, Peggy and the rest, but the 60s–and many other historical periods–are alive and swinging in Google Magazine Search. To do your own investigation of historic advertising, you can search Google Magazine through the Advanced Search option. With fully searchable text, including the ads, you too can probe such weighty questions about meaning and identity–also, less weighty ones like this. Tomorrow, Sat. 10/16, the second annual Boston Book Festival is expected to attract more than 25,000 attendees to celebrate, discover and learn about books. We’ll be there to celebrate with them because we see books as important keys to human culture, knowledge and progress. 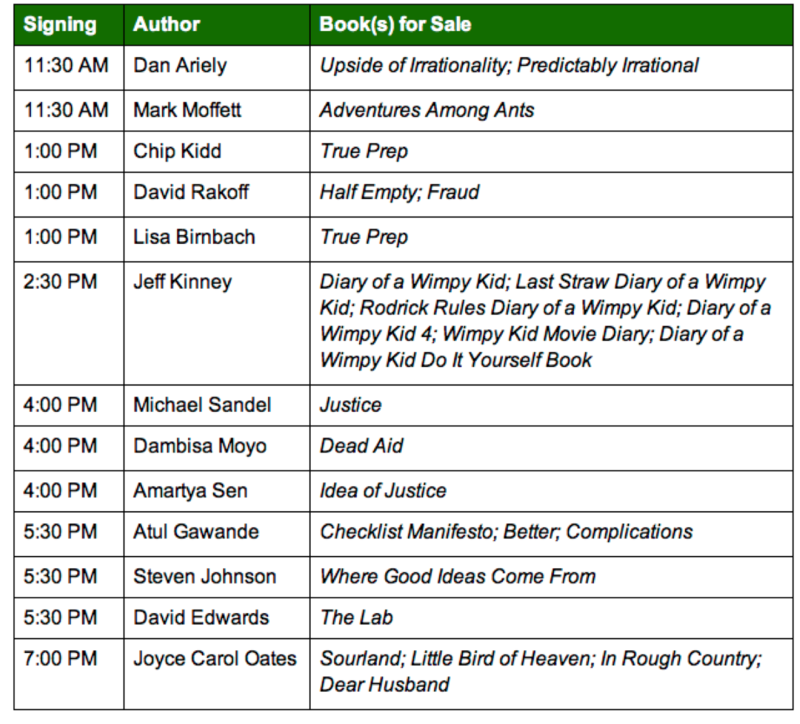 Bostonian Googlers will be there all day, hosting book sales and author signings in our booth in Copley Square outside of the Trinity Church alongside an Internet lounge for people who want to share their experiences with the rest of the world. We hope those of you nearby can attend the Boston Book Festival — which is free and open to the public — and drop by our booth anytime between 10 AM and 8 PM. 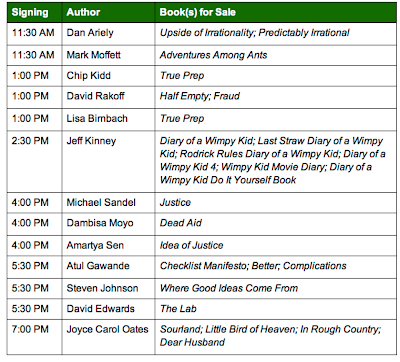 Here’s the book sales and author signing schedule. Happy reading! ‎‎ Microsoft’s renowned social media researcher danah boyd (yes, the lower case is intentional) is in the news again since Fortune magazine announced her as One to Watch. danah is currently off doing fieldwork, so we decided to run our Microspotting interview with her from early 2009 – shortly after she started working for Microsoft. How’s it going getting settled into NERD, aka Microsoft’s New England Research & Development center? Right: you’re not only transitioning into a new job and new city — but also out of dissertation mode. How’s that going? Yup. New city, new job, far far far far far more human interaction. I mean, in the last six months of my dissertation, i really didn’t see anyone but my partner. I was a COMPLETE hermit. Mandatory isolation is required training to be an academic. That said, I’m loving the people at NERD, so it’s a welcome re-intro into civilization. I mean, they’re just as geeky as I am! So, give me a glimpse into the range of researchers on your team. You research social interactions on the web, but aren’t a sociologist. Do you identify more with information systems? Scholarly labels come with a lot of baggage — they mean specific things about method, theory, framing. I’m pretty darn interdisciplinary in my approach to scholarship. My work in the last few years would be closest to anthropology, but most anthropologists wouldn’t count me in their club. Rick Rashid calls me a computer scientist which just makes me ROFL. Honestly, i avoid those labels like the plague, but here, it’s kinda tricky. I wrote a rant on my blog about why i chose this lab. I don’t really care about what the industry has to say about MSFT. I’m here because it’s the most interesting place i could be at. Which was rougher: defending your dissertation or defending your choice to work for Microsoft? Honestly, I can’t even compare my dissertation or job. . . both pale in comparison to defending the Enhancing Child Safety and Online Technologies Task Force Report that I put out. It’s been complete hell trying to get politicians to accept data that doesn’t match their worldview. It made everything else feel like cake. What I really care about is that the company values research. Microsoft Research is hands down the most impressive research institution i’ve seen. Even though my research has product implications, i’m not a product person, but i love being in a place where my work funnels into products. I also think a lot of folks underestimate the role that MSFT plays in shaping policy, both explicitly and implicitly. I hope my research also shapes policy going forward. Interesting. What policies are you most curious about impacting? Well, right now, the policies related to youth and the internet … but in general, policies and practices that involve information sharing and communication. There’s always an interaction between companies and policy. At the most mundane, companies have to figure out how to implement policies that are put into place. But companies also shape how those policies are formed, how they are thought about, and how they are implemented. MSFT has played a major role in many different policies and it’s been shaped by them too. So, once you get settled in, what are you must excited about sinking your teeth into, research wise? Mostly, i’ve been puzzling about boundaries, especially around the notions of public/private and how people manage tensions of audiences online. Everyone’s up in arms saying that the kids don’t get privacy. And of course there’s the old battle cry that privacy is dead. But i think that both are dead wrong. I think that privacy is playing out in new ways that are connected to the dynamics of social media. So, i want to explore that. In the short-term, it’ll mostly mean looking at things like Twitter and Facebook Status Updates and whatnot, but i’m more into the bigger issues than those particular technologies. This morning I’ll be speaking on the topic of the present and future of Google Books at the Europeana Open Culture conference at Westergasfabriek in Amsterdam. Now as much as ever, our shared vision of bringing all the incredible content stored in the world’s books online depends on working with libraries, publishers, authors and book lovers. Europeana is a digital library initiated by the European Commission to bring together digitization projects from around the continent. Europeana works with European libraries, archives, and museums to collect and make easily accessible the books, music, film and art that make up Europe’s cultural heritage. It is an important project, and it shows that around the world, public and private bodies see the value of digitization in order to provide broad access to our shared cultural heritage. To date, working with library and publisher partners around the world, we have scanned more than 15 million books from more than 100 countries in over 400 languages as part of the Google Books project we started in 2004. The greater the diversity of content on the web, the more useful it becomes. And the more people who can access the information cataloged in books, the more enlightening those works become. Check back soon for highlights from the conference. I’m gearing up for an interview with Microsoft. I’m prepared for the technical questions, but want to know what non-technical "soft skills" I should focus on in my interview. Any suggestions? In Part I of my answer, I explained The Three P’s of Microsoft: Passion, Potential and People and I focused specifically on how to convey "Passion" during the hiring process. In Part II, I discussed "Potential. Today, in my final part of this series, I will talk about "People." The hiring process is all about people. People make Microsoft a positive – and fun – place to work, learn, play and innovate. Candidates who accept an offer from Microsoft over competing companies often tell me that they chose Microsoft because of our employees. It is very common for someone to say, "It was the team of people I met during the interview process that impressed me and helped me to pick Microsoft." Microsoft is full of very intelligent and motivated people. We consistently file the top number of new patents in the software industry, which is a direct reflection of the innovative people who work here. These are the people with whom you’ll interview and with whom you’ll need to connect on a personal and intellectual level. If you have some unique skills that they feel you will bring to the collective IQ, there’s a good chance that you’ll get a job offer. If you demonstrate intellectual horsepower during your conversations and you are perceived as a team player, you have the skills that we’re looking for. Intellectual horsepower can be demonstrated in many ways from having an engaging conversation on a broad range of subjects to comfortably dealing with concepts and complexity to giving concrete examples of the work you’ve done which showcases your capacity to achieve. For example, if you’ve designed a solution, written a piece of code or tested an application on a regular basis, explain the direct results of your efforts (e.g. reduced downtime by 25%, increased uptime by 10%, boosted sales, customer satisfaction increased by 20%). If you can describe your achievements during the relatively short opportunity of an interview, it will set you apart from other candidates on account of your talents, strengths and capacity to produce significant contributions on a product or service. When smart, creative, passionate people get together, the results are astounding and the opportunities limitless. I’m Microsoft Certified and interested in a new role, but am not sure where to start. Any suggestions? We will be hosting a global 24-hour virtual Career Conference on November 18th. This "Microsoft Certified Career Conference" will focus specially on people in your postion. There will be an opportunity to meet potential employers, hone your technical knowledge, acquire job-seeking skills, network with fellow professionals and glean career advice from real-life experts in the field including Microsoft representatives – all in real time. And, if by chance you are an employer reading this and you’re interested in finding some great new Microsoft Certified employees to join your team – click here. We would love to have you participate as well! Virtual career fairs are still relatively new, but are great way to job search and attend a career fair in the comfort of your home. No long waits in the airport security line or stocking up on business cards. If you are able to join us – definitely fill us in about your experience and share your thoughts with our readers. Or just tell us what you thought about this new venue for connecting with companies. The more attention this gets from job seekers, the more we’ll host these types of events in the future. I am able to network when I already have an “in” with someone. But what about networking with strangers? Do you have any pointers on how to approach contacts you don’t know? There are many different mediums and places you can meet work contacts: conferences, LinkedIn, restaurants, you name it. I’m not going to go into those, because I think the secret to networking is the same no matter the medium. And the big secret is not really that much of a secret at all: be genuine, be polite and ASK for what you want! First, a little personal background: I’m a Disney nut, as in I’m an annual passholder at Disneyland. I visit several times a year and typically visit Walt Disney World every other year or so. You get the picture. A month back, I was hunting online for some Disneyland pictures. I discovered an amazing photography blog, Tours Departing Daily, which you have to see to believe. The pictures use High Dynamic Range (HDR) imaging which was new to me. I had recently picked up photography as a hobby and purchased my first digital SLR camera (although I knew little about this type of camera at the time). I sent an email to the Tours Departing Daily blog owners sharing my enthusiasm for Disneyland and admiration of their photography. I also asked if they would be willing to spend some time with me during my upcoming visits to the park and show me how to use the camera. After a few email exchanges, we set up a date and a time. Matthew, Michaela and Kevin – who run the blog – spent two and a half hours walking me around the park, teaching me how to use my camera and explaining the process of making HDR images. So why do I share all of this with you? Because I did nothing more than to be genuine, polite and ASK for what I wanted. And I achieved my goal – and more. The worst that will happen is you’ll get a “No,” and you’ll be no worse off than when you started. I’m not sure of his context, but for me it means that – if there’s something I really want – I’m going to keep asking because after that final no, there’s eventually a yes.